Hello again SG readers, this is the second installment in my series of interviews with esports professionals that I think you’ll love. Today I bring you one of my favorite commentators from across the pond, Mr. Dan Gaskin. When I met him at Dreamhack Denver, he immediately began talking shop and I received a quite an education so I figured I would pick his brain and share his knowledge with all of you. RR: Can we get the Dan Gaskin origin story? How did you arrive where you are now in the esports world? DG: I guess my first true venture into Esports was Halo 2. After loving Halo 1 round a cousins house I picked it up on launch and played so much that I obliterated all of my friends and online modes. I ended up finding a UK Halo group who included some of the top UK halo 1 players at the time. I went to my first social LAN at 13 l, and then they began making their own LAN tournaments called ‘XL’ which I helped staff and compete in. Ever since then I had dabbled in various games competiting in many tournaments and LAN events including Halo, Gears, FIFA, PES, CS:GO, Forza, Hearthstone. I was hitting top 3/4 placements in UK Halo tournaments but stopped competing when I went to University to study performing arts. After my degree i picked up Halo 4 and got back on a top 4 team. 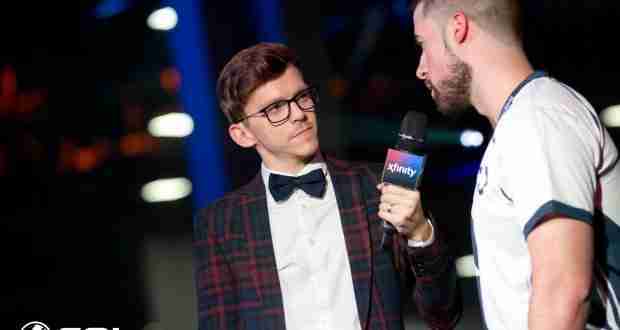 Halo 5 came around and I was planning to compete again until I was offered the chance to commentate the qualifiers for the world championship back in December 2015. This was where my career began, casting weekly with Simms and invited to Germany to commentate the finals of the EMEA region. I missed out on the world championship that year but I wasn’t too heartbroken because there was so much more ahead of me. I began doing more games for ESL when they eventually decided to hire me full time. Thus bringing me to where I am today, commentating and hosting for ESL across various esports titles and other companies. RR: You get to experience esports cultures across the globe, what are the noticeable differences between the different regions, and what stays constant? DG: The scale of esports varies from culture to culture. We (the UK) are obviously smaller than other countries so audiences and player bases don’t reach the heights of USA, China etc. However Europe as a whole definitely tries to compete. In terms of gameplay, two of the games I commentate most are Halo and Hearthstone. Halo in Europe tends to be more passive and slow, scared to mess up. Whereas American Halo is lightning fast and taking risks. In Hearthstone Europe dominates because they are more sensible with their deck selections but in China they have weird inclusions that would often just ruin their chances. RR: What would you say those who are under the impression that the esports community is full of elitism and harassment? DG: I’d say esports can be just like any other working environment. People still can receive bullying and harassment there are just some not very nice humans in the world. I’ve never experienced it personally but I’m not so ignorant to imagine it cannot happen anywhere within esports just because we all like gaming. RR: There’s always a little tug of war between casual and pro players, do you have any thoughts on the matter? DG: As a commentator we are expected to tailor to both. However statistics would suggest we should be tailoring more so to the casual as more casuals tend to watch than pro players, for a lot of games anyway. Some of the games with less viewership and tighter communities are probably watched by more pro players. You need to just adjust for an audience. I think it’s important both pro and casual are happy with a game. Sometimes the pro scene is disregarded slightly because they tend to be the smaller player base but I believe with the growth of esports this is slowly changing and developers are more inclined to please the elite. RR: What teams or organizations do you think are worth paying attention to at the moment? DG: London spitfire from the Overwatch league are just insane. So I guess Cloud 9 too considering they own the team. Optic of course from either Halo or COD are always good to keep an eye on. Plus I’ll plug my EU boys Infused in the UK are hopefully going to do big things at the upcoming Halo World Championships. RR: Be honest, do bow ties give you super powers? DG: Honestly, yes. They actually stop me from ageing. I want to thank Dan for taking the time to chat amidst his crazy schedule, hopefully I’ll see him stateside soon. If you want to know when to catch Dan in commentator mode or you just wanna see cute dog pictures, Dan’s Twitter is you’re best bet, @DanGaskin.